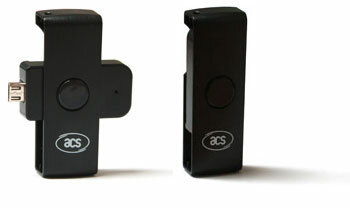 The ACR38T-D1 'Plug-in' SIM-sized smartcard reader from ACS is a USB 2.0 device that carries all the functionalities of a standard ACR38 reader packaged into a sleek and lightweight case. 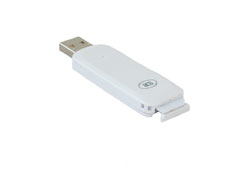 The ACR38T-D1 reads and writes to ISO 7816 cards as well as numerous memory and GSM 11.11 compliant cards. PC/SC and CCID compliant, this reader supports seamless interoperability across different platforms and environments. The ACR38T-D1 features a sleek white case and secure card eject mechanism but is otherwise functionally identical to the popular ACR38T-IBS reader. The reader comes complete with WHQL approved drivers for Windows and supports other operating systems such as Mac and Linux.